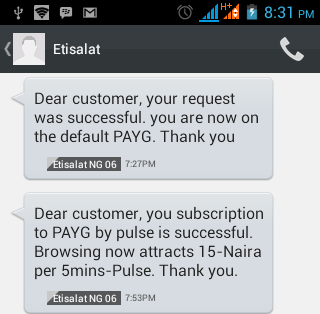 The Etisalat paygo has been blazing for months now and the sharp guys are browsing and downloading unlimitedly with it. But unfortunately some people are still not getting it right. I just think it will be okay if we can all enjoy it while it last. Today I will be explaining in details how to setup the paygo, stream videos with it and I will also be answering some Frequently Asked Questions (FAQ). ==> In case you don’t have any data on your sim card, just subscribe for the daily 5mb for just #5 by dialing *330*1# (or *330*1## for android devices). ==> Dial *229*5*7# to activate the paygo, in case you get the msg “sorry operation failed. Please……..” it simply means you are currently on the paygo plan. Just deactivate by dialing *229*0# to de activate and then dial *229*5*7# to re activate. (N.B: make sure you don’t turn on your data until you get the confirmation msg). ==> First download and install hotspot shield vpn for your android device.Here. ==> launch the application and select any server of your choice. ==> Now you can visit any website of your choice. ==> First download and extract HotSpot Shield Elite + Patch v3.42.Download HERE . ==> Copy Hosts file and paste here (C://Windows/System32/Drivers/Etc). ==> Apply patch, now have Elite status. ==> change the country of server. N.B: It has only been tested on 64bit pc, but you can also try it on your 32bit. ==> make sure you have at least #15 before you start browsing. because that’s when the renewing takes place. ==> Never stream video unless you have a vpn connected. ==> make sure you don’t turn on your data until you get a confirmation msg. ==> Q. should I activate the paygo before recharging or after recharging. A. you can activate the paygo before, after or while recharging *if that’s possible* the most important thing is that you must be on paygo and you must have at least 0.4mb before you turn on your data. ==> Q. is it compulsory I subscribe for the daily plan before I can use the paygo..
A. no. it’s not compulsory. The most important thing is that you must have data on your sim card. You are to subscribe for the daily mb when you have no data. ==> Q. I just recharged and I was giving free mb, but am already on the daily 5mb. Should I unsubscribe. A. yes. Since you are given free mb you can unsubscribe from the daily mb (by dialing *330*2##) and keep on using your free mb until the mb expires. ==> Q. how much is the minimum amount that must be on my phone. ==> Q. while browsing I got the msg “you have used hope your data…….” What should I do. A. That means you have violated one of the rules. The 1st thing you have to do is to disconnect your browser and check your account balance. If your account airtime is still there, then you have to subscribe for the daily plan by dialing *330*1#. And if you were on the daily plan before, then you have to un subscribe first by dialing *330*2# before you re subscribe. ==> Q. can I use the Paygo on my windows phone. ==> Q. I always get the msg “you have used up your …….” Or “you are almost there…….” Even before the browsing stops. A. that means you have to do the timing by yourself. Always disconnect after 50mins of browsing even if the browsing has not stopped yet. ==> Q. my money got deducted while I was browsing. How do I reconnect. A. turnoff your data, just load another airtime on the sim, you should be given free mb, Thats all. But in case you get no bonus mb, subscribe for the daily plan by dialing *330*1#. And if you were on the daily plan before, then you have to un subscribe first by dialing *330*2# before you re subscribe. Then you can start browsing. ==> Q. is it possible to stream video with the paygo. A. yes it is possible but only with the help of a vpn. 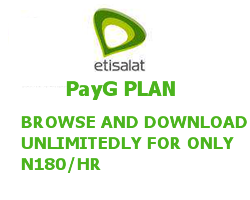 I believe have been able to explain the Etisalat paygo the simplest way possible and have also answered most of the FAQ. But if you think I omitted some things or you still don’t get it. Just drop your complaint in the comment box and I will attend to you.